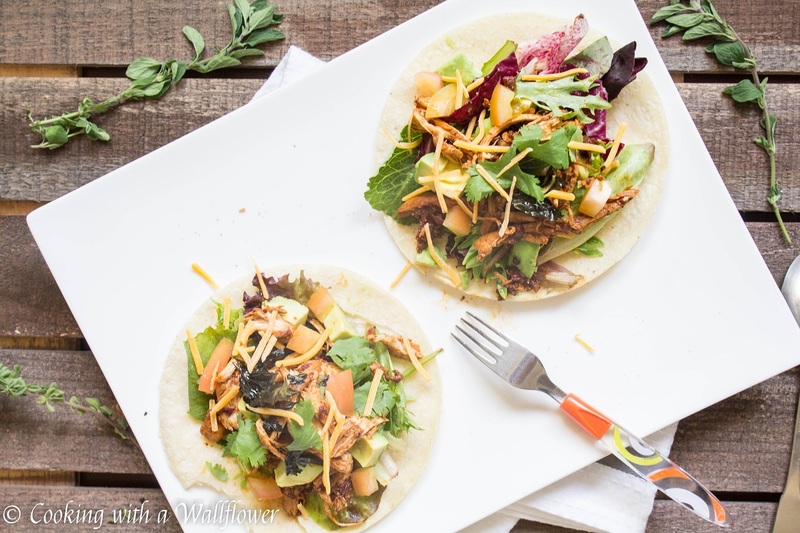 Tacos filled with shredded honey chipotle chicken, spring mix salad, tomatoes, and shredded cheese. 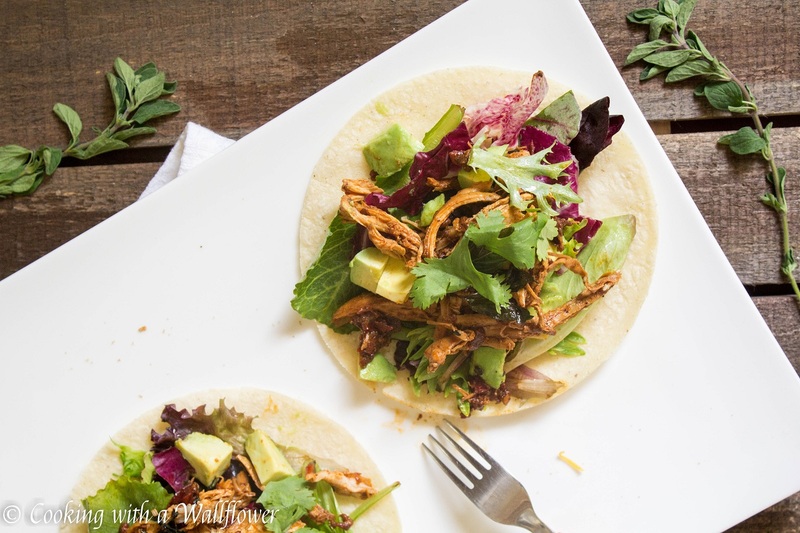 These honey chipotle chicken tacos are perfect for taco nights. Tacos! I don’t think we’ve talked about tacos in awhile. Which means we have to remedy that ASAP. So about a month ago, I posted a recipe for honey chipotle chicken. The chicken is tender, the flavor smoky and slightly spicy. And it is my favorite chicken recipe so far. I mean, how can it not be since it works with so many other dishes. Like this honey chipotle chicken avocado toast. Or with your favorite pasta or salad. If you prepare this chicken ahead of time, you’ll be set for a couple meals. It’s super easy to make, but it does take about two hours for the chicken to marinade. That way the chicken can absorb all that amazing flavor. Plus, guess what? This chicken made it onto Buzzfeed! Let’s talk about these tacos though! Tacos are soo fun to eat and absolutely messy. Every bite means something falling off or dripping from the other end. You know exactly what I’m talking about. But I’m not always a fan of eating with my hands, especially when I order tacos from a food truck, which I’m a fan of. Food truck food is amaaaazing. Unfortunately, there isn’t always a bathroom nearby for you to wash your hands, so how do you know your hands are absolutely clean? So sometimes, I try to get a napkin underneath the taco and eat them way. More like, devour. Or, you can never go wrong with a fork and knife. Yes, I eat my tacos (and burgers) with a fork and knife. Does anyone else have this germaphobic dilemma? Which is why I love that I can make my own tacos at home. Plus, I like making taco night an event. Taco nights are always buffet style, where all the ingredients are prepared and placed into their own little dishes. Then we can all individually fill up our tacos. Tacos are so customizable! You can add your favorite chopped lettuce and salads, diced tomatoes, corn, chicken, pork, beef, shrimp. Then you can add a dollop of sour cream, guacamole, or salsa. See? So many options! First, make the honey chipotle chicken. You’ll need about 2.5 hours or so prepare, marinade, and cook. But trust me, totally worth it. You can store the chicken in an air tight container in the fridge up to a few days until you’re ready to use it. 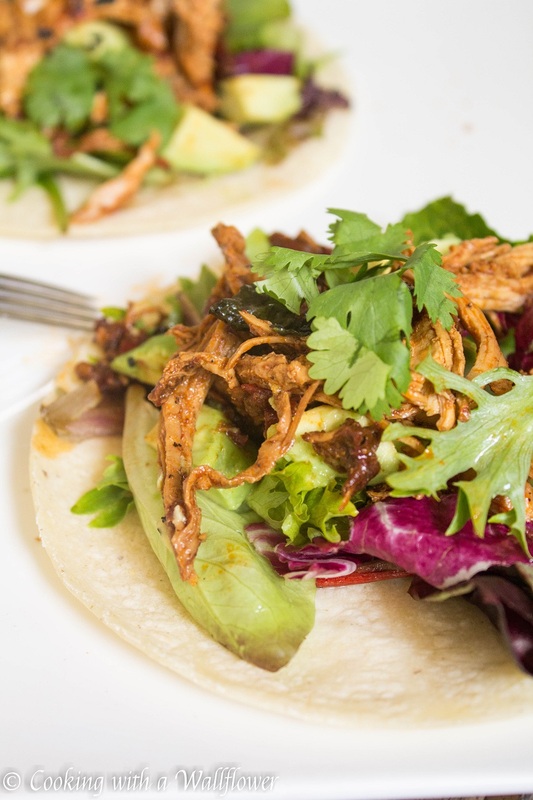 When you’re ready to make the tacos, heat up your tortillas. You can do this on a skillet or in the oven. 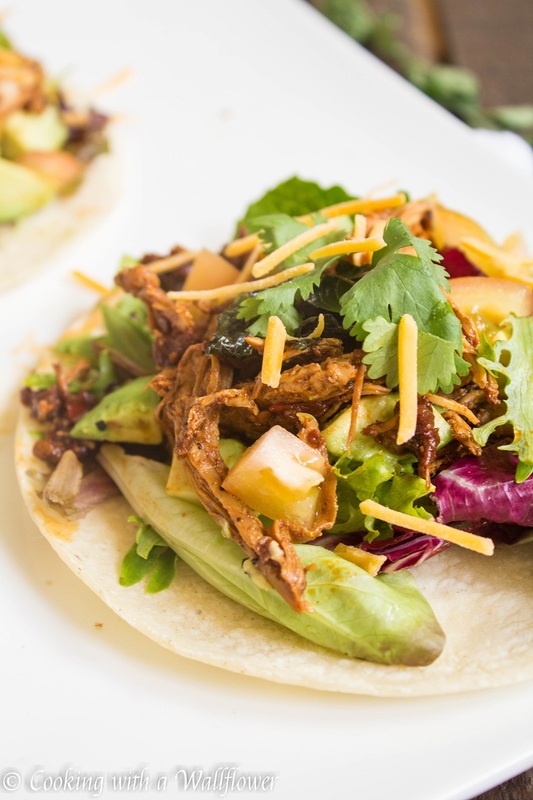 Layer the tortilla with either chopped up lettuce or a spring salad mix. I like using a spring mix salad because it’s colorful and there’s so many different vegetables in there. 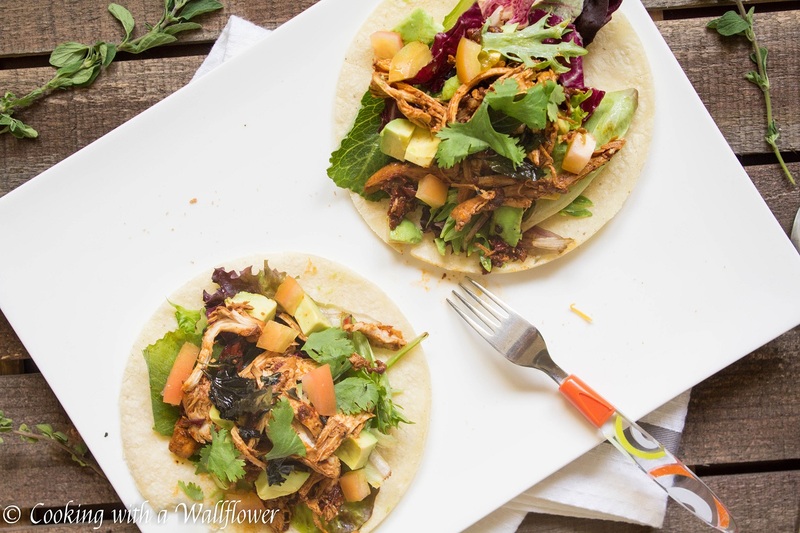 Add the warmed honey chipotle chicken, diced tomatoes, shredded cheese, and diced avocadoes. And of course, you can add your favorite condiments too. Salsa, guacamole, sour cream, whatever you like. 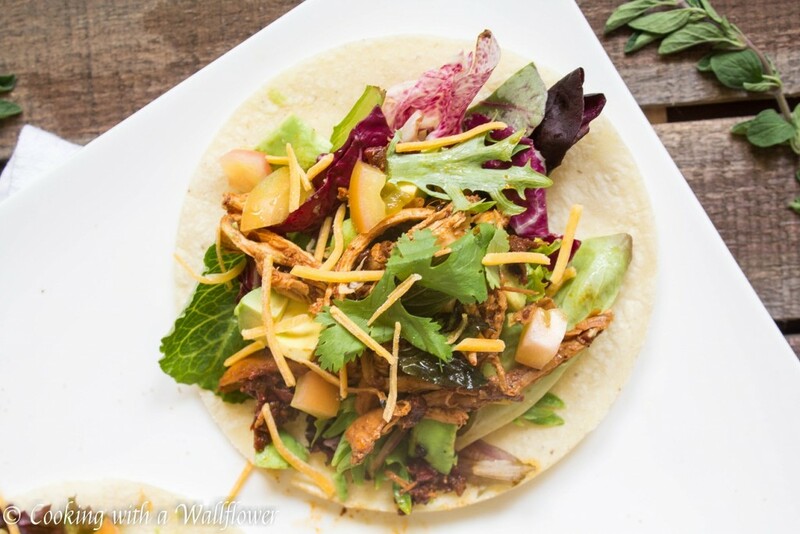 Tacos filled with shredded honey chipotle chicken, spring mix salad, tomatoes, and shredded cheese. 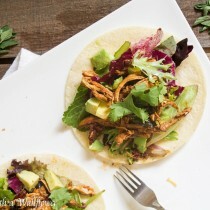 These honey chipotle chicken tacos are perfect for an amazing dinner with guests. Heat the tortillas either on a skillet or in the oven until they’re warm. Place a layer of the spring salad mix over the tortilla. 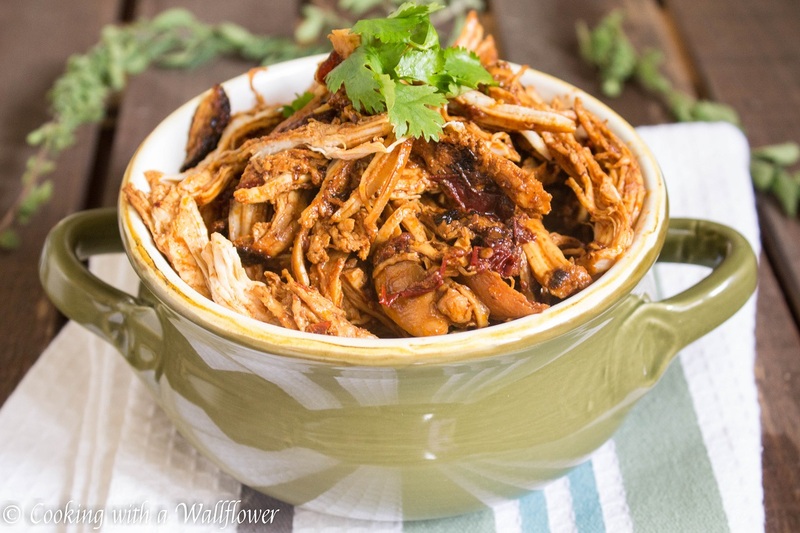 Then add the shredded honey chipotle chicken, diced tomatoes, diced avocado, and shredded cheese. If desired, place the tacos in the oven to melt the cheese. Serve the tacos with sour cream, salsa, and guacamole. Garnish with cilantro. Honey chipotle chicken has to be prepared in advance. Link to the recipe is in the post above. 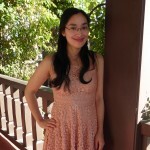 This entry was posted in Appetizers, chicken, Entree, Farmer's Market, Gluten Free, Quick and Easy, Recipes and tagged farmer's market, gluten free, quick and easy.